There’s something delicious that happens when you combine crab and artichokes together, making a delicious Baked Cheesy Crab and Artichoke Dip. Who knew? Artichokes are considered a vegetable, although they are actually a variety of thistle, cultivated for food. So you are kind of eating a weed, although a very delicious weed. It’s easiest to buy Artichoke Hearts which are sold in glass jars usually in a brine or marinated in oil. Either one is fine to use, as long as you drain them from their liquid. It’s also perfectly fine to buy canned crab from the supermarket, which works perfect in this recipe. 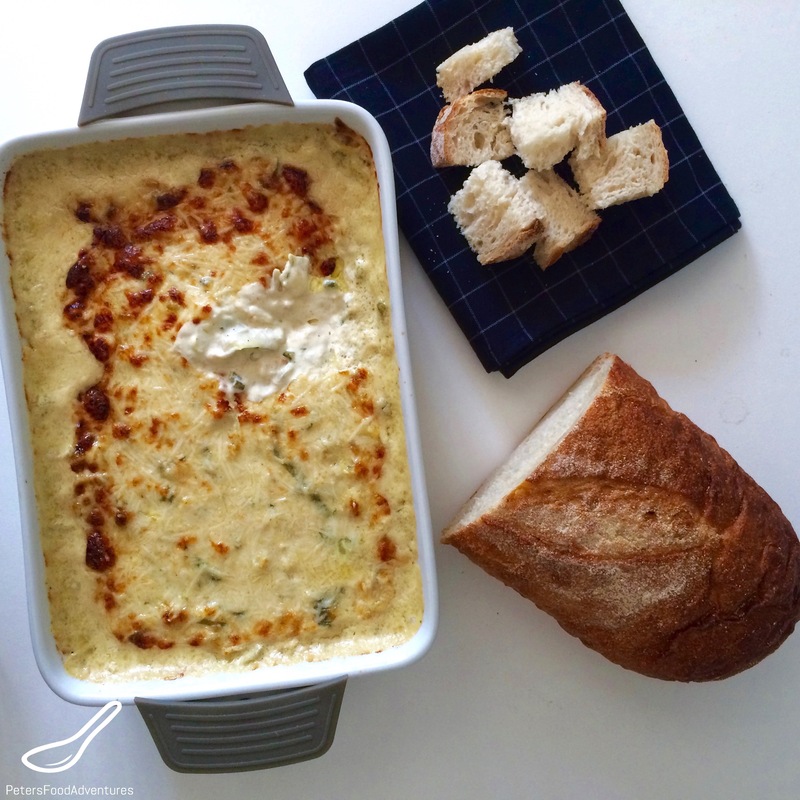 This Cheesy Warm Crab and Artichoke Dip is really easy to make, and surprisingly quick. You can whip this up in about half an hour, including baking time. It’s perfect when you have people coming by, a perfect appetizer for a party. I’m thinking a games night or a movie night, an appetizer for Christmas, or maybe you just want to eat it by itself. Though I’ve never done that! (cough) Just be warned, when you take it out of the oven, it’s extremely hot, be careful not to burn your mouth. Cream Cheese is an optional extra when making this recipe. If you skip it, you can add an extra half cup or mayo and half cup of sour cream. I also like to spice it up a bit by adding Jalapeños or even a few teaspoon Cajun spice to the mix. This snack could give you a heart attack! We usually eat this with a sliced French baguette or a Sourdough loaf, but there are so many delicious crackers out there now that would work also. If you haven’t had Cheesy Crab and Artichoke Dip before, it’s perfect on a cold night, but we warned, you’ll be hooked! Bon Appetit! Приятного аппетита! Drain the artichokes and chop them into small bite size pieces. Mix all the ingredients together in a bowl except the parmesan cheese for the topping. Put the crab cheese mixture into an oven proof serving dish, and top with the grated parmesan cheese. Cook for 20-25 minutes until bubbly and golden. Serve with a sliced baguette or crackers. Oh my gosh…just super yummy!!! Totally delicious and fattening, and worth it! ???? Hahaha….Everybody deserves a special treat now and then! ???????????? This one is so easy to make, and makes you look good as a cook. Lol Easy is what I like! ???? Thank you Peter! Yes! I will be making this. I’m sure it will become a family heirloom style hit for years to come! Aw, Thanks so much, I appreciate it! I hope you enjoy it! Yore so welcome. I have no doubt we will. Thanks Linda, sometimes I use both!